Mosquitoes chased us out of our favorite state park dog walking trail the other day. We thought the city would offer us refuge from the onslaught. Never had a reason to be thankful for mosquitoes before. Our meanderings led to torn up street construction that had proven fruitful before. We spied newly open ground and very quickly whisked our poor dog companions back toward the car so we could take them home to “rest” while we hastened back to the street to see what we might find. A few hours later, we headed back to the pups feeling richly rewarded. ( at least one of us anyways ) Day one started out with 1898 Barber quarter hit, followed by a metal “charge a plate” (did research and discovered it was an early aluminum credit card with owner’s name and address imprinted on it) found a bit later. Both of us found wheat pennies, before I happened upon a sweet hit that turned out to be a 1903 S Barber half. Partner feeling distinctly unlucky at that point. That feeling only heightened after I found what we are fairly sure is a woman’s gold pocket watch. ( taking it to local watch repair to have it opened and verified soon) She made me stay longer hoping to find something, but then I found a 1901 Indian head penny. Finally time to go home to the pups. Day two minor payback for her, she found 1883 Indian and 1935 mercury dime. Talked to workers, will be closing street soon and are done for th e year. Last edited by Treasure2some; 09-12-2018 at 09:07 PM. The Barbers are nice but that watch is over the top. Please do post picture of the face once opened. Holy smokes!! That pocket watch is amazing! Big Congrats!!! 'Luv those old-town demolition tearout tractor work projects ! What!?????? Nice!!!!! Give those Pups a extra ration of kibble! Hey TTsome,..Coin Club Meeting Tomorrow...Bring that watch and I'll show you my NOX! Nice hunt man, let's see some more shots of that watch! Nice hunting, great story too! Congrats! Wow! Coins are great but that gold pockewatch is amazing! Congrats! Update: All that glitters unfortunately is gold fill. We had an expert look at the watch. 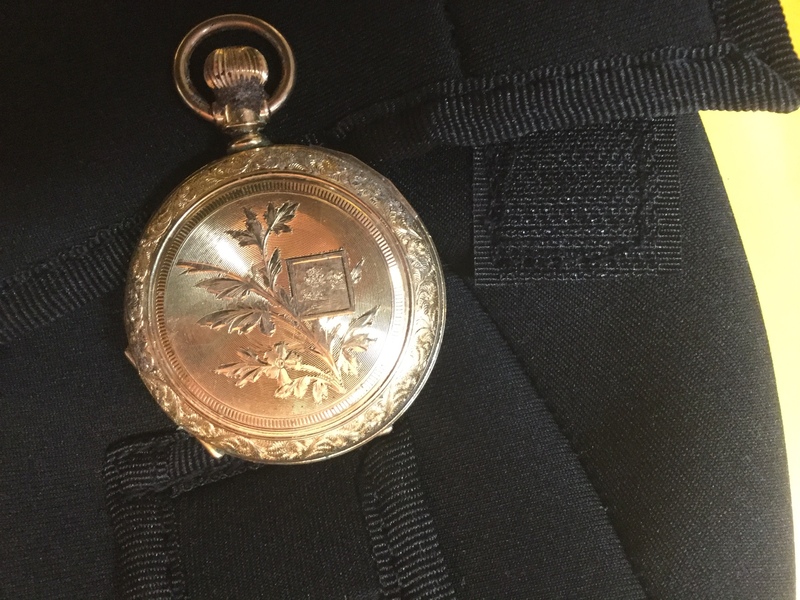 Checked the hallmarks and serial number and found that it is an 1889 10k gold fill Elgin Ladies pocket watch. The inside of the watch was trashed by the conditions it existed in for perhaps a century. Still a very nice find. It will look amazing in your display case. Spectacular! there's no other word for that watch, just spectacular! Nice watch! Pity it was trashed inside. That pocket watch is SWWEEETTTT! Not one pic of the pups???? Still a beautiful find, congrats. Your lucky , your good and you know your Hood . Congrats ! Wow, that's a great report full of goodies! Nice story too; with the mosquitos, the poor ol' doggies, the friendly competition with the lady friend, and limited time frame, silver, Big silver, multiple wheaties, the fancy pocket watch, and all! That early credit card is a cool thing to find too! Congrats. Update us if you get any more from there. Wow that watch is beautiful congrats!